Here's the most complete guide to Heartburn and indigestion. Heartburn is the consequence of indigestion but it involves many other factors. While indigestion mostly occurs due to insufficient flow or secretion of gastric juices that include hydrochloric acid in the stomach, heartburn is felt when part of the acidic stomach contents reflux back into the esophagus (the tube that carries food and drink to the stomach) causing irritation to the esophagus inner linings. The principal culprit in heartburn is the lower esophageal sphincter or LES that inappropriately open up allowing the reflux. Indigestion may happen to anyone consuming bad or contaminated food items. It can also happen from too much of spicy food that is not suited to the person - but this need not necessarily mean that he or she would experience heartburn or acid reflux if the person's LES is functioning normally. It is only when the feeble LES fails to hold back the stomach contents and lets it leak into the esophagus that heartburn takes place. Besides, indigestion is seldom chronic, unless it is accompanied by other more serious health conditions whereas heartburn associated with gastroesophageal acid reflux or GERD often takes the chronic form. Even the treatment form of indigestion and heartburn are totally different. While temporary indigestion can be easily treated with enzymes or some such digestive medications, heartburn requires a holistic approach for ultimate cure. Heartburn and indigestion - how to solve the puzzle? Since heartburn resulting from chronic GERD involves a multitude of factors, some of which are not even understood till now, doctors advise change in lifestyle in the hope that the trial and error method may rectify some erroneous or bohemian way of life that caused heartburn and related discomfiture. The initial episode of this involves selection and elimination of food and drink one by one. If potatoes are suspected to be the wrongdoer, it has to be eliminated from the diet for a few days to watch if the frequency of heartburn has diminished. If yes, then it is eliminated, if not, it is reinstated. Similar is the case with eggs, beef, and all kinds of sauces and condiments and cheese. Next come the beverages. If elimination of Red wine restores normalcy, it should be permanently discarded from the list of beverages and replaced by White wine or vice versa. Then there are certain food items that may be termed as taboo for heartburn patients. This includes tomatoes, all citrus fruits or fruit juices, rich or spicy foods, five-course lunches and dinners, scotch on rocks, cigarettes and cheroots and all processed foods like ham, bacon, sausages and heavily fat layered pork chops. The only sure way to fight acid reflux and its symptom (such as heartburn) is to identify all the factors that cause it in the first place, which can be many by the way. Identify the contributing factors and take steps to correct them and the symptoms will be automatically go. To do this, the body has to be treated as a whole and not just the symptoms, which is the approach of holistic remedies. 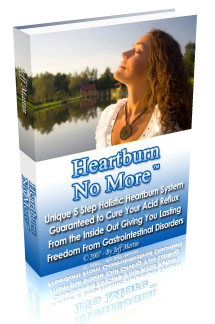 So when suffering from heartburn, turn to holistic remedies for a more efficient treatment.